Corfe Bears > Charlie Bears > TOADSTOOL 13"
Toadstool is the final bear in the first HATTY BEAR SERIES, which has been very popular. His rich emerald fur is really thick and has lots of white tipping, but this tipping is missing on his muzzle as it has been shaved so that you can see his brown hand-stitched nose and mouth and dark twinkling eyes. His light paw pads stand out against the green fur and they have been sculpted and the claws are stitched in brown, to match his nose. 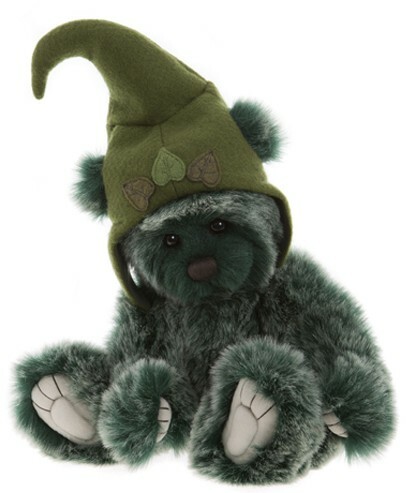 He looks quite quirky, as his little ears peek out from the holes in his green felt hat, that has 3 felt leaves sewn onto the front. Toadstool is from the Charlie Bears 2019 Collection.